APPLY ON-LINE at. InsureAlabama.org. health coverage. Download "APPLY ON-LINE at. InsureAlabama.org. health coverage." 1 APPLY ON-LINE at InsureAlabama.org Application for Health Coverage & Help Paying Costs Use this application to see what coverage choices you qualify for Affordable private health insurance plans that offer comprehensive coverage to help you stay well A new tax credit that can immediately help pay your premiums for health coverage Free or low-cost insurance from Alabama Medicaid or ALL Kids. You may qualify for a free or low-cost program even if you earn as much as 94,000 a year (for a family of 4). things to know Who can use this application? 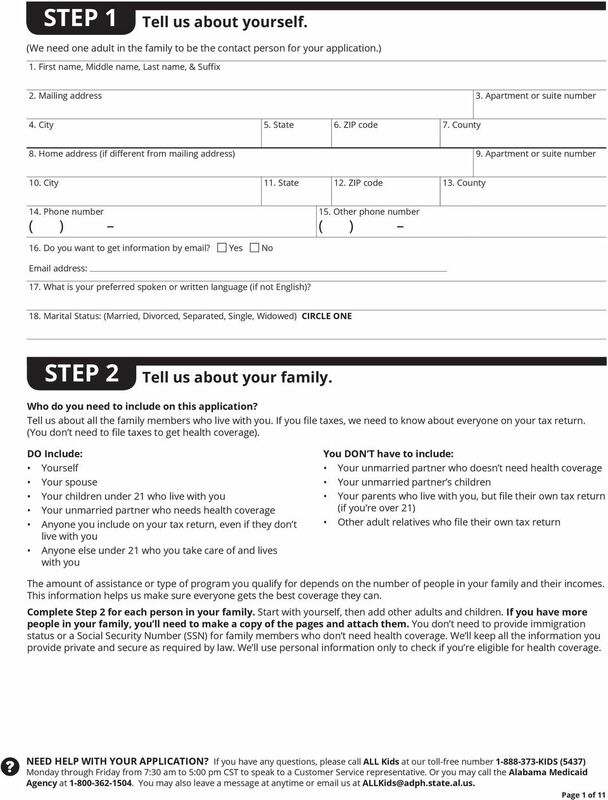 What you may need to apply Use this application to apply for anyone in your family. Apply even if you or your child already has health coverage. You could be eligible for lower-cost or free coverage. If you re single, you may be able to use a short form. If you do not need help with cost, go to HealthCare.gov. Families that include immigrants can apply. You can apply for your child even if you aren t eligible for coverage. Applying won t affect your immigration status or chances of becoming a permanent resident or citizen. 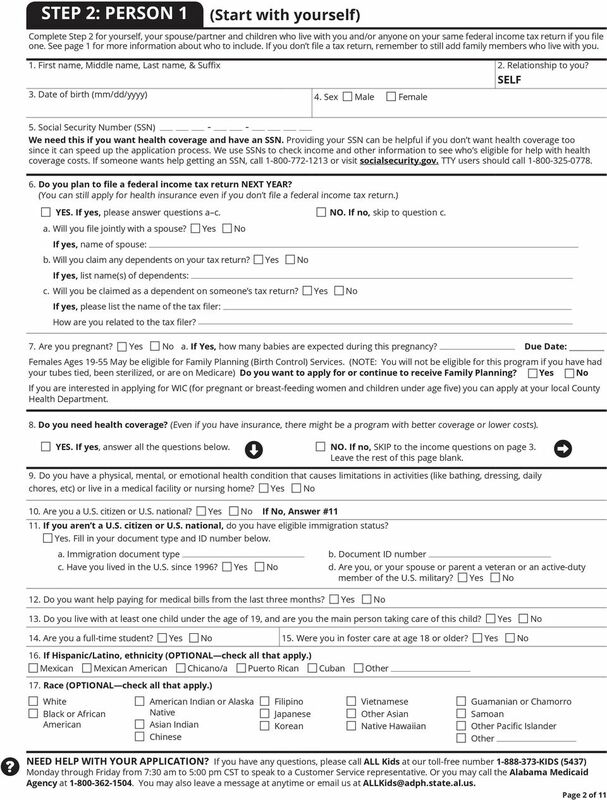 If someone is helping you fill out this application, you may need to complete Appendix C. Social Security Numbers (or document numbers for any legal immigrants who need insurance) Employer and income information for everyone in your family (for example, from paystubs, W-2 forms, or wage and tax statements) Policy numbers for any current health insurance Information about any job-related health insurance available to your family Why do we ask for this information? We ask about income and other information to let you know what coverage you qualify for and if you can get any help paying for it. We ll keep all the information you provide private and secure, as required by law. To view the Privacy Act Statement, go to HealthCare.gov/placeholder. What happens next? Send your complete, signed application to the address on page 11. If you don t have all the information we ask for, sign and submit your application anyway. We ll follow-up with you. 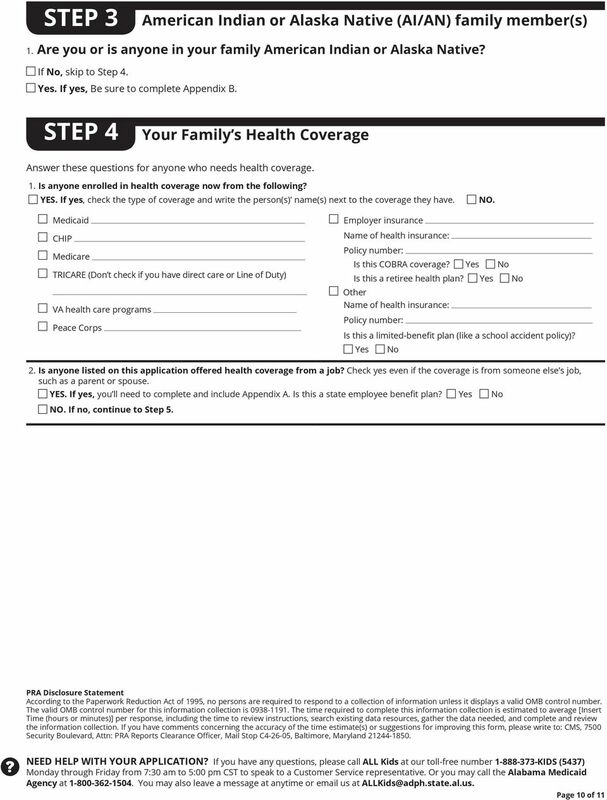 You ll get instructions on the next steps to complete your health coverage. If you don t hear from us, call the Alabama Medicaid Agency at or call ALL Kids at KIDS (5437). 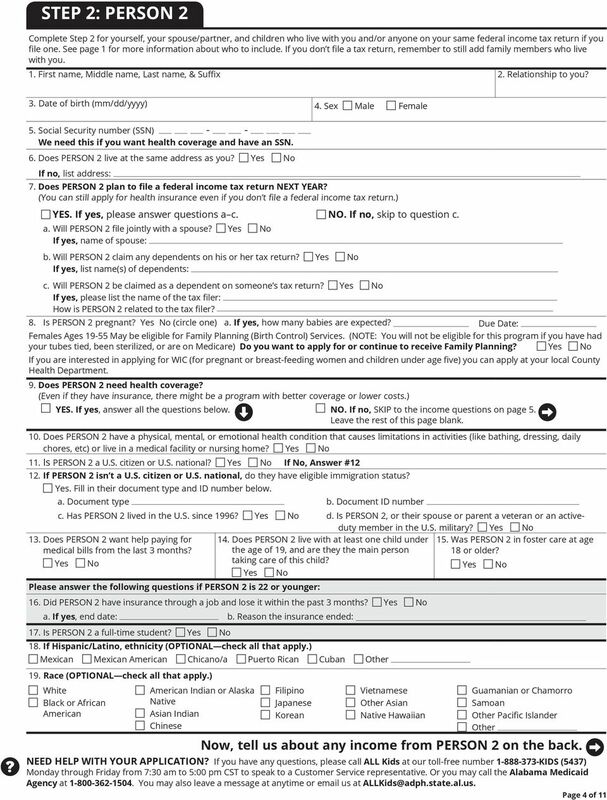 Filling out this application doesn t mean you have to buy health coverage. South Carolina Department of Health and Human Services Application for Medicaid and Affordable Health Coverage Use this application to see what coverage choices you qualify for Who can use this application? 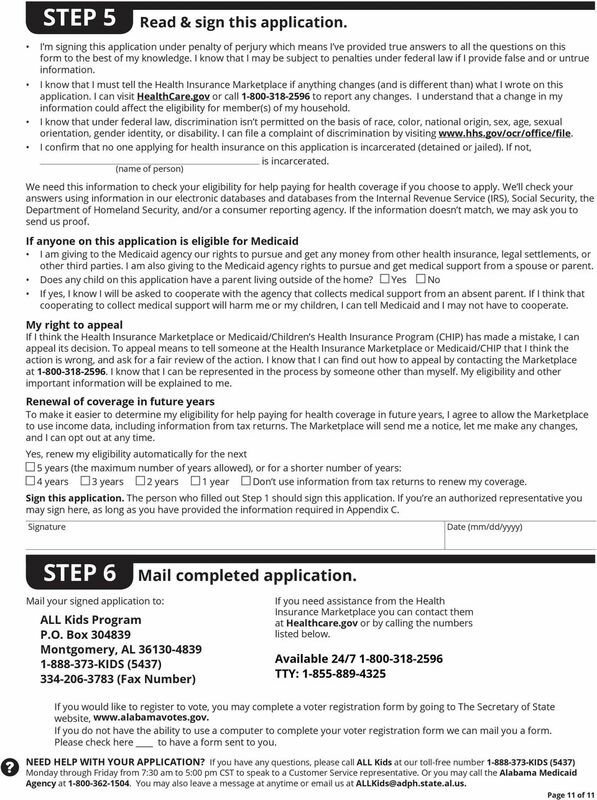 Use this application to see what Medicaid and/or Children s Health Insurance Program (CHIP). coverage choices you qualify for. New tax credits that can immediately help pay your premiums for health coverage. DRAFT. Apply faster online at www.placeholder.gov. 01.16.13 Application for Health Insurance (and to find out if you can get help with costs) THINGS TO KNOW Use this application to see what insurance choices you qualify for Who can use this application? Massachusetts Application for Health and Dental Coverage and Help Paying Costs THINGS TO KNOW HOW TO APPLY Use this application to see what coverage choices you may qualify for. Who can use this application? Apply faster online at CoverOregon.com. Use this application through September 2014 TELL US ABOUT YOURSELF (You ll be our primary contact person. APPLICATION FOR HEALTH COVERAGE and financial help to lower costs Apply faster online! Apply faster online at CoverOregon.com. Use this application to find out if you qualify for: Who can use this application? IMPORTANT REQUIRED INFORMATION Please complete and return the following questions for each person in your household. We asked you some of these questions on the application, but we need more information. 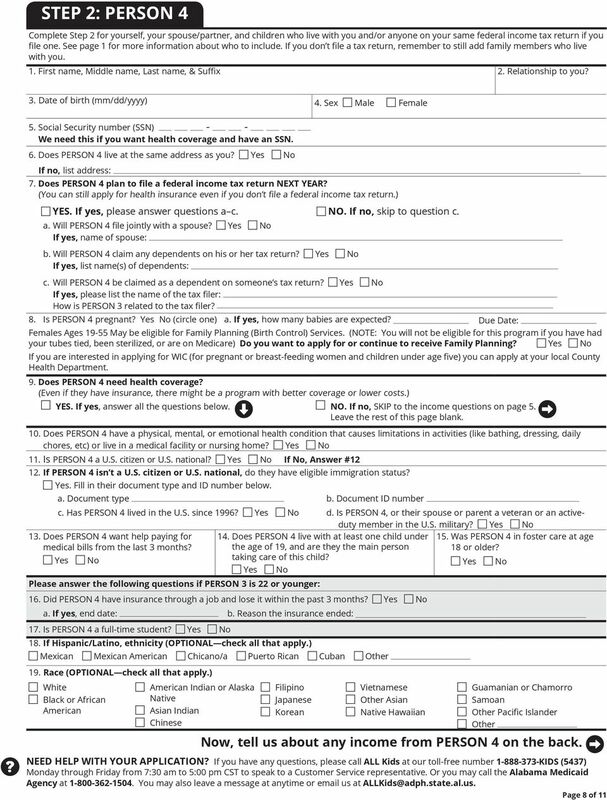 10/2014 Application for Exemption from the Shared Responsibility Payment for Individuals who are Unable to Afford Coverage and are in Certain States with a State-based Marketplace Form Approved OMB No. 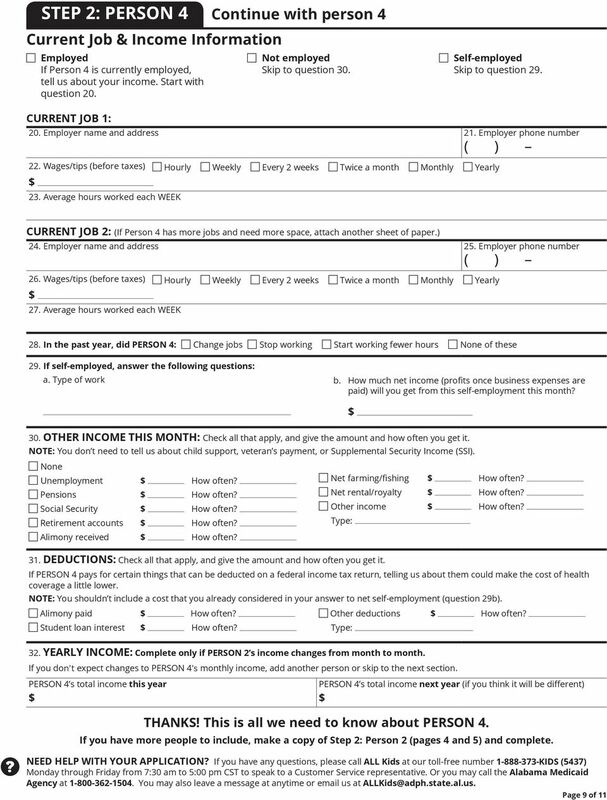 Use this application to apply for an exemption from the shared responsibility payment. Who can use this application? 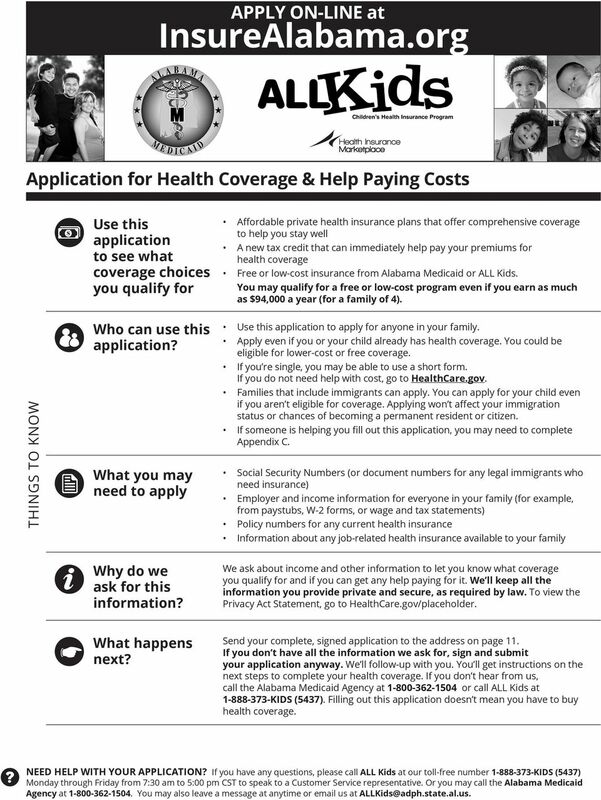 Application for Health Care Coverage Easy, affordable protection for your family. If more space is needed for your responses, please use a separate sheet of paper and attach it to this supplemental form. SECTION I. Answer the questions in Section I to determine if application needs to be completed for person needing help with medical bills. WHAT ARE HEALTH CHECK (MEDICAID) & NC HEALTH CHOICE FOR CHILDREN? 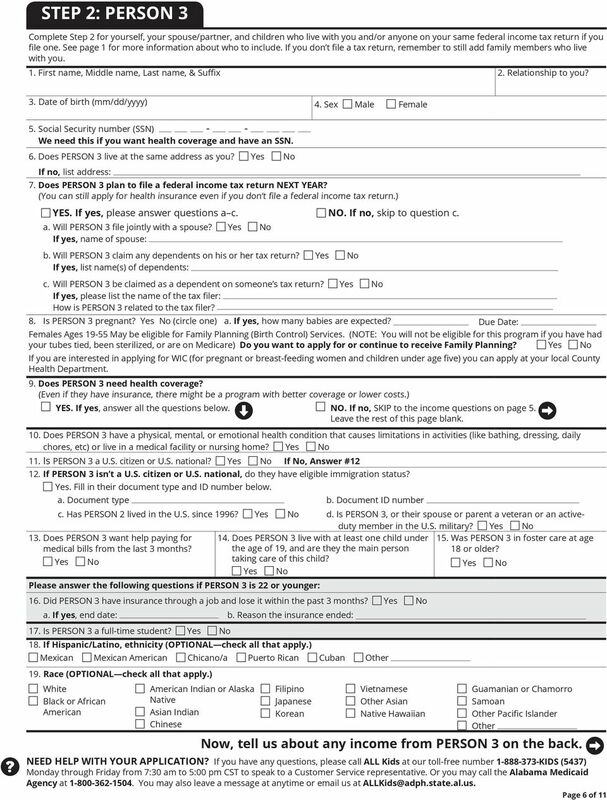 HEALTH CHECK (MEDICAID) NC HEALTH CHOICE FOR CHILDREN APPLICATION Free or Low-Cost Health Coverage This application may also be used by parents, caretakers, pregnant women & other adults to apply for Medicaid. Commonwealth of Pennsylvania chipcoverspakids.com Application for Health Care Coverage This page has been left intentionally blank. Information about health care coverage Who can use this application? Small Business Health Options Program (SHOP) Health coverage application for employers Maryland Health Connection s Small Business Health Options Program (SHOP) is open to all eligible small business owners.